DJ Krush (Hideaki Ishii) was born in 1962 in Tokyo. At an early age, Ishii dropped out of school, and joined a local gang, and a few years later, Yakuza. After watching the film ‘Wild Style’ in the early ’80s, he was inspired, bought himself a set of turntables, and began to learn the art of turntablism. 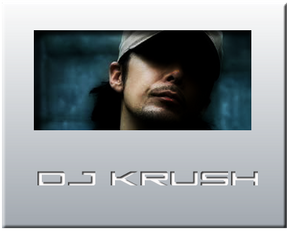 In 1987, he formed the KRUSH POSSE, which made numerous appearances as a group in late 1992 which gave him recognition for becoming the first DJ in Japan to perform with live musicians. He released his first album ‘Krush’ in 1993, which stated his presence in the scene, and he has since released thirteen more. He has had recording contracts with Chance Records, Ninety Nine Records, Mo-Wax (he was the first Japanese artist to join them), and Apollo and Sony/Columbia. He works internationally as a producer, remixer, DJ, and recording artist, bringing the unique flavour of Japanese hip-hop to the world.